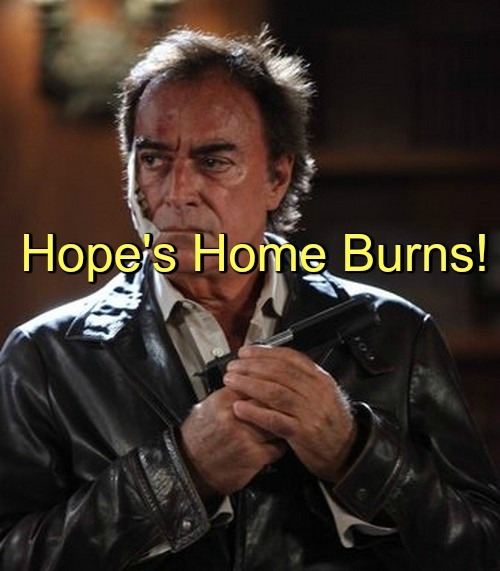 “Days of Our Lives” spoilers reveal that Andre (Thaao Penghlis) will devise a way to make Hope (Kristian Alfonso) pay for murdering Stefano (Joseph Mascolo). Andre is heartbroken over his loss and furious at Hope for causing it. That’s the perfect storm for the ultimate revenge plot. Andre’s first step is a small one, but it may create big results. DOOL spoilers say Andre will reach out to Chase (Jonathon McClendon) in hopes of pulling him over to the dark side. Chase is already in a gloomy place at the moment, so this is actually a very smart move. Ciara (Vivian Jovanni) and Theo (Kyler Pettis) both blew up at Chase for being a bully. Now Chase fears he’ll never truly have forgiveness from either one of them. Andre will offer a sympathetic ear and some twisted guidance. “Days of Our Lives” spoilers tease that Andre will attempt to get in Chase’s head. He’ll try to manipulate Chase’s behavior and it could lead to trouble. Hope will be livid if she finds out that Andre is influencing Chase’s decisions. Chase is feeling vulnerable and he could act out in volatile ways. It’s fitting that “Days” seems to be taking this route since Aiden (Daniel Cosgrove) (who is returning to DOOL) was also a DiMera minion. Aiden’s debt made his participation mandatory when it came to Stefano and Andre’s schemes. However, Chase is simply a young man who feels alone and has no sense of purpose. If Andre can help Chase feel accepted and useful, there’s no predicting what he might do. Since Chase is just entering this bizarre friendship, he probably won’t realize he’s a pawn yet. Nevertheless, Andre will weave his web and Chase could end up getting in over his head. “Days of Our Lives” spoilers indicate that an alarming fire will spark at Hope’s house. There’s no word on the extent of the damage, but many DOOL viewers will be worried about how this turns out. We just got this set back a few months ago and it’s arguably one of the show’s best. Let’s hope that the blaze doesn’t destroy the house beyond recognition. Fortunately, it doesn’t look like anyone will be seriously injured as a result of the fiery chaos. Still, Hope will understand that Andre poses a real risk to her family. Rafe (Galen Gering) and Hope will soon be working overtime to make sure they keep Andre at bay. Stick with the NBC soap for updates on how they’ll neutralize the threat. So “Days” fans, what do you think about the news that Andre will try to lure Chase over to the dark side? Will Chase embrace his inner villain or eventually see the light? What about the shocking fire? Will it prompt Hope and Rafe to take drastic action? Voice your opinion in the comments below and don’t forget to check CDL often for the latest “Days of Our Lives” spoilers, updates and news. Days of Our Lives (DOOL) Spoilers: Brady Comforts Theresa Over Paige’s Murder – Silver Lining to a Terrible Week? Days of Our Lives (DOOL) Spoilers: Chad Holds Baby Thomas – Evil Trance Broken, Love for Abigail Floods Back!